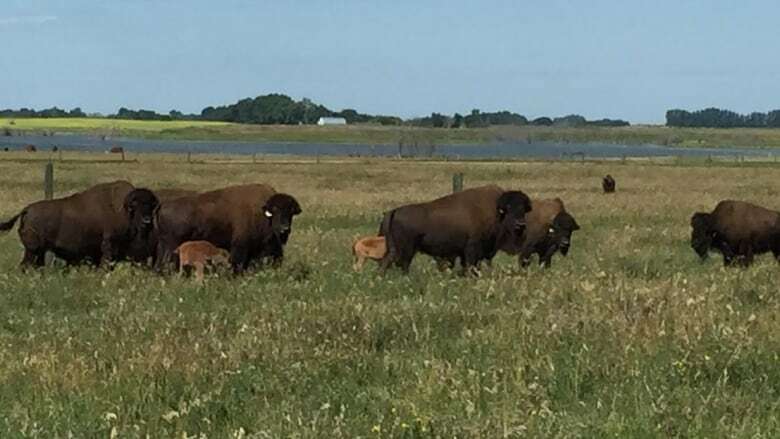 U of S researchers produced the world's first wood bison using in vitro fertilization. Creating bison in a laboratory sounds like a premise for an unusual science fiction movie. But it's a fact, and the proof is gambolling about on a U of S campus field. "The babies look great," said Gregg Adams, a reproductive specialist with the Western College of Veterinary Medicine. "They're keeping up with mom, and I'm really happy about it." It took a decade to get the idea from the drawing board to running around in a field, and Adams said its success has enormous implications for the species. It's been a rough 80 years for wood bison, with less than five per cent of the North American herd still alive in the wild. The animals suffered from disease, which they contracted from cattle eight decades ago, and loss of their habitat. The dwindling population also meant a loss of genetic diversity. Adams said one of the attractions of using in vitro fertilization is that it allowed researchers to "scrub" embryos of disease. "We can now actually fly in to isolated herds, say for instance Wood Buffalo National Park, identify individuals, collect their eggs and sperm, and then bring them back to the laboratory so that we can wash them free of the disease," he said. "If we could take those embryos and put it back into healthy surrogate moms, voila -- we have a way of regenerating, re-capturing this really important genetic diversity that we need." Researchers produced three embryos in a laboratory and then transferred them into surrogate mothers late last year. The bison cows gave birth to the calves earlier this month. A fourth calf came from a frozen embryo that was taken from a bison cow in 2012 and then transferred to a surrogate mother last year. This was another reproductive first for the species.